A teacher looks on as her prekindergarten students use a calendar to identify shapes at Stafford Elementary School in Tacoma, Washington, on April 30, 2014. Comprehensive federal policies can help states ensure that members of the early childhood workforce have adequate compensation, benefits, and support for their professional growth. America’s economy is dependent in no small measure on the 2 million educators who comprise the early childhood workforce.1 Without this largely female workforce, millions of working parents with no or few high-quality child care options would be unable to participate in the U.S. labor force. Despite the importance of early childhood educators—to the economy, parents, and young children—low wages, minimal benefits, and a lack of professional supports are commonplace. One of those early educators is Carmella Salinas, who was interviewed by The New York Times in July 2016.2 According to The New York Times, Salinas earns just $12.89 per hour as a teacher in a child care center in Española, New Mexico, after almost 15 years in the field. Her center cannot afford to provide her with benefits, so she is limited to working 32 hours per week. This past summer, however, Salinas was without work because not enough parents could afford the center’s full tuition, which is offset by pre-K funds during the school year. Salinas had to wait for a new school year to begin in September when state pre-K funds could pay her salary. The volatility of her wage situation has taken a toll on Salinas and her family. She struggles to afford her utility bills, and it takes her months to save enough money to cover additional expenses such as car repairs. At one point, Salinas got a second job to supplement her child care wages. She then earned too much to qualify for Medicaid and the Supplemental Nutrition Assistance Program but too little to comfortably afford groceries and the two inhalers she needs for her chronic asthma. Salinas told The New York Times that she found herself rationing the medication—taking just one puff instead of four per day—to save money. The story from The New York Times went on to explain that many early educators—including Salinas—have limited opportunities for career advancement. Although policymakers and researchers increasingly see a bachelor’s degree as a needed credential for high-quality care programs, degree programs are inaccessible to many teachers. While New Mexico, for example, offers a stipend to help teachers earn degrees and stay in the field, underfunding means that the program nevertheless falls far short of covering the cost of attending and graduating from college for many teachers. Salinas’ stipend only covers one class per semester, but there is simply no way she can afford the cost of extra classes on top of meeting basic needs.3 Consequently, she has been taking classes toward her bachelor’s degree for more than a decade. Salinas’ experience is not unique: Early educators across the country struggle to make ends meet on dismal wages and limited benefits. Child care workers and preschool teachers are in the bottom quintile of annual salaries in the United States, averaging less than $30,000 per year.4 Child care workers are also less likely to have benefits compared with similar workers in other industries.5 When the adults working in early childhood programs face stress associated with poverty and income volatility, the children they serve are affected as well. Research consistently shows that high-quality early childhood programs depend on a professional, well-compensated, and skilled workforce, but early childhood educators remain underpaid and undervalued in the current U.S. early childhood education system. Low wages and limited professional development opportunities are symptoms of an early childhood system that is underresourced and fragmented. States have made laudable efforts over the past decade to professionalize the early childhood field with limited resources. However, these efforts have generally been piecemeal—applying only to particular teachers in particular programs—or have lacked robust funding sources to meet the workforce’s needs. Moving forward, the workforce must be a priority in comprehensive legislation for early childhood care and education. In addition to increasing funding levels, the federal government must craft comprehensive policies to ensure that early childhood workers receive adequate compensation, benefits, and support for their professional growth—no matter where they work or who they serve. This report identifies six policies that the federal government should include as part of significant federal financing reform for early care and education. These policies will be implemented in partnership with states and communities. With more than 6 million children in child care and preschool,6 early educators play a significant role in young children’s daily lives. The country’s underresourced and fragmented early childhood system undermines the quality of care and education that these workers can provide. The federal government must work with states to implement coordinated, integrated policies to promote a diverse early childhood workforce that is skilled, supported, and adequately compensated. Fragmented policies and inadequate resources present significant barriers to creating a high-quality early childhood system. These challenges include inadequate compensation and benefits, inconsistent workforce standards, and uncoordinated professional development systems. The early childhood workforce includes educational staff—meaning those who work directly with children—in child care centers, Head Start programs, state- and locally funded pre-K programs, private preschools, and family child care programs. For the purposes of this report, the authors refer to these workers collectively as the early childhood workforce, early educators, early childhood educators, or teachers. More specific terminology—child care workers or home-based providers, for example—is used when citing research or data that use a particular term or title. Unless otherwise noted, references to the workforce exclude center or program leadership, such as directors, administrators, and principals. Why are teachers’ wages so low if child care costs are so high? In the past year, media coverage intensified on both the high costs of child care and the seemingly paradoxical low wages for the early childhood workforce. How can early educators earn so little when programs are so expensive for parents? More often than not, programs are barely breaking even in order to meet basic licensing standards, which do not account for educators’ economic well-being. Implementing features of a high-quality program—such as research-based curricula, developmental assessments, and intensive professional development—is even more costly. On top of these expenses, adequately compensating a highly qualified workforce is a mathematical impossibility when public funding is limited and parents cannot afford to pay higher tuition rates. Professional development encompasses education, training, and technical assistance, including coursework toward a degree or credential, basic health and safety trainings, skill development workshops, and ongoing mentoring or coaching.36 High-quality, effective professional development is important to support teachers’ practical skills in the classroom and to promote career advancement. However, the existing professional development systems reflect the underresourced and fragmented early childhood system itself. Without a centralized system of professional development, workshops, trainings, and college coursework all operate largely in isolation from one another. Consequently, professional development content is not necessarily aligned with the most recent research, standards of practice, or needs of employers.40 In addition, the skills and competencies that are acquired through professional development or coursework do not necessarily translate into progress toward advanced degrees or credentials. This is extremely costly to an already low-wage workforce, both in time and money. As of 2015, children of color comprised more than half of the population of children under age 5.41 As the population of young children continues to diversify, it is critical to ensure that the demographics of the workforce reflect those of the children in its care. 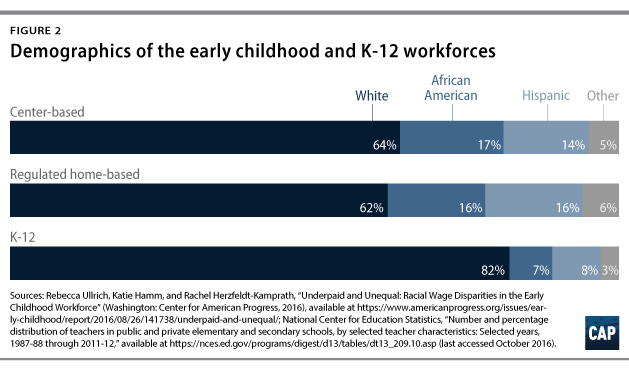 The early childhood workforce is relatively diverse at present—particularly compared with the K-12 workforce. (see Figure 2) Maintaining and building diversity in the field should be a parallel goal to professionalization. Significant advancements in early care and education policy are long overdue. It is critical that the United States shifts away from piecemeal initiatives toward comprehensive reform. Future legislation must infuse enough funding to simultaneously reduce costs for low- and middle-income families, promote high-quality services, and improve conditions for the workforce. 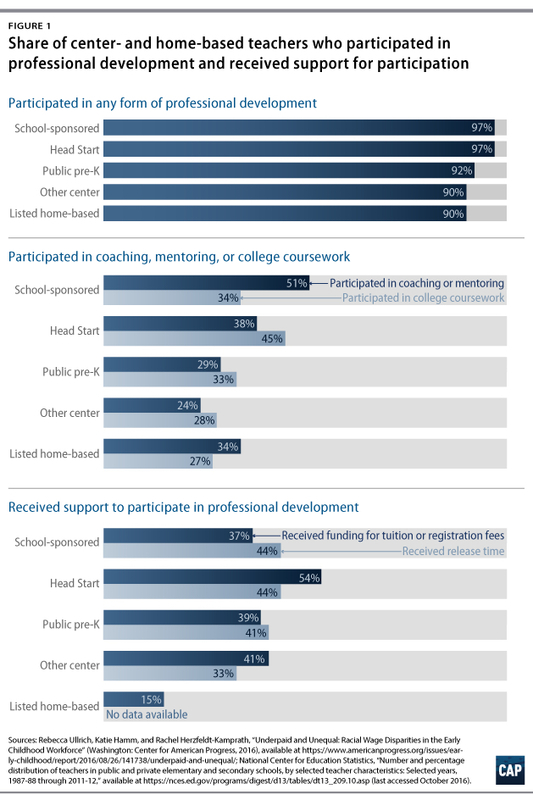 The Center for American Progress proposed one possible approach that would expand tax credits for child care and funding for voluntary universal preschool—calibrated to the cost of operating full-day, high-quality programs.46 These strategies would provide programs with higher levels of funding per child, which would serve to boost early educator salaries. On top of a new financing approach, reform must address the existing barriers and challenges created by historical underfunding and fragmentation. Solutions aimed at only addressing one problem—such as increasing education and training requirements without improving compensation—will likely exacerbate the existing problems with turnover and have a disproportionate impact on teachers from lower-income communities and the children they serve. The following six policies should be incorporated into federal reform for early childhood care and education with the goal of promoting a professional early childhood workforce. These policies should ultimately be implemented by states in partnership with the federal government. States need coordinated professional development systems to prepare and train a skilled early childhood workforce. The benefits of professional development are maximized through a coordinated network of education, training, and technical assistance.47 Various forms of professional development should both align with and inform one another such that they work in combination to provide teachers with core knowledge and skills. Has stackable credentials. Stackable credentials build upon each other, are reflective of increasing knowledge and skill, and typically connect progressive levels of education.52 Stackable credentials can help early educators make the jump from shorter-term certificate programs to longer-term degree programs. Is accessible. Education and training must be targeted to early educators balancing coursework with full- or part-time employment. Programs should be available through a mixture of online and in-person mediums, during the evenings and weekends, and in accessible locations. Coursework and training must also be available in multiple languages to support non-native speakers. Extends beyond traditional coursework. Teachers should have the opportunity to participate in shorter-term workshops and trainings that target specific knowledge or skills and complement classroom-based learning. For example, a teacher might participate in a series of workshops related to integrating technology into the classroom or effective data collection practices. Trainings and workshops should be augmented by supervised practice in the classroom. In particular, states should establish forms of continuous technical assistance such as mentoring and coaching to support ongoing skill development. Provides credit for prior learning. Early educators should have opportunities to demonstrate what they know and are able to do and apply those acquired skills toward credential attainment. Receiving credit for prior learning allows early educators to focus on new or lesser-developed content and competencies at their own pace. The U.S. Department of Health and Human Services identified career pathways as a key strategy to help states and programs address inconsistent compensation, expectations, and professional development across sectors.54 Career pathways identify a sequence of credentials that are reflective of progressively higher competencies and are tied to particular roles or job titles. When used across early childhood programs, career pathways can reduce fragmentation in program standards for staff and provide a clear road map for early childhood professionals to advance. While most states have done some work to sequence early childhood credentials, career pathways are often not meaningfully implemented in early childhood programs.55 For instance, such approaches are not used consistently in early childhood programs across the state, nor are they necessarily tied to advancing roles and compensation in the workplace. Most state ladders or pathways are only used in select programs or are used solely to inform individual teachers’ professional development. These limitations inhibit the ability of any given state’s efforts to advance early care and education as a profession. Offer a progression for career development that individuals can use to set career goals and identify steps to meet those goals. This approach allows for specialization based on job characteristics such as age group or function and also provides clear guidance for advancement. Establish compensation standards based on education or training. Guide other early childhood systems. For example, professional development systems should all be reflective of the competencies and credentials outlined in the career pathway.58 Likewise, a state’s quality rating and improvement system, or QRIS, should use the career pathway to define progressively higher teacher requirements to advance to higher-quality ratings. The federal government should also lead by example and create wage parity for Head Start teachers in the next reauthorization. Although three-quarters of Head Start teachers now have a bachelor’s degree, they earn $31,242 annually—more than $20,000 less than the average kindergarten teacher salary.61 Likewise, the federal government should leverage Preschool Development Grants and any subsequent federal preschool funding to encourage states to address compensation disparities within their public pre-K programs. As described in previous sections, existing parity policies fall short of serving many teachers in the public pre-K system. Teachers in public pre-K classrooms—both in public schools as well as in community-based settings—should earn salaries and benefits on par with kindergarten teachers in the local public school district. While family child care providers can be seamlessly integrated into many policy solutions—including credential requirements and professional development supports—addressing compensation for the home-based workforce is complex. As small-business owners, family child care providers have some agency around the number of children they care for and the number of hours they work, which affects their revenue. Increasing per-child funding levels will help increase providers’ take-home pay. However, states must also develop strategies to ensure that family child care providers who choose to work full time can earn a living wage. States should increase participation in their early childhood workforce registries to gather relevant information about the early childhood workforce. Early childhood workforce registries are online systems that include characteristics of early childhood workers and their programs of employment.62 Workforce registries allow teachers to track their progress toward their professional goals; enable centers to verify teacher participation in various professional development and training opportunities; and inform state early care and education administrators about the workforce. When the data collected in registries are robust and comprehensive, they can inform state policies around teacher credential requirements and participation in professional development; identify geographic areas in need of workers with specialized education and training; and help states target financial and technical assistance resources to underserved areas. Workforce registry data can be linked to states’ QRIS to easily verify that programs have met particular standards. They can also be linked with child-level data systems to analyze associations between programs, teachers, and children for the purposes of research that improves systems and practices in the classroom. As early childhood programs increasingly require or encourage higher credentials for staff, states must bolster their existing scholarship programs to help offset the cost of tuition and other expenses. There are few data on scholarship recipients, but evidence suggests that these programs are fairly limited in scope and impact.66 Scholarship awards are likely too small in amount to offset a significant amount of the cost of tuition or fees. Programs generally lack the resources to support all eligible members of the workforce in any given state. State scholarship administrators should use data collected through their workforce registries to target scholarship funds based on the unique needs of programs and workers in their states. For example, in states where public pre-K teachers are required to have a bachelor’s degree, policymakers may choose to target scholarship funds to teachers serving children ages 3 and younger. Other states may choose to target teachers seeking education and training in high-need specialty areas, such as early childhood special education, early intervention, or dual language learners. States should also consider prioritizing educators who may experience more significant barriers to higher education, such as teachers in rural or high-poverty communities. To incentivize professional growth and retention, some states have turned to wage supplement initiatives, which provide a lump sum to teachers once or twice annually. However, wage supplements cannot replace an increase in compensation across the board for the early childhood workforce, nor do one-time bonuses truly offset the upfront costs of higher education and training. Instead, states should consider the following strategies as a means of providing bonuses or incentives to early childhood educators. State-funded tax credits for members of the early childhood workforce are an emerging strategy to promote and reward continuing education, training, and retention.70 At present, Louisiana and Nebraska have adopted a tax credit program for the early childhood workforce. While eligibility for participating teachers varies, both states award higher tax credits to teachers with higher levels of education and credentials. In some states, tax credits are a preferable funding mechanism—compared with other wage supplements—because, as part of the tax system, they are stable and not subject to approval each year. The federal government should provide flexible resources to states that choose to adopt some form of ongoing, stable bonus or incentive structure to promote continuing education and advancement within the field of early childhood education. The Louisiana School Readiness Tax Credit, started in 2008, promotes early childhood program quality by providing refundable tax credits to families, programs, members of the early childhood workforce, and businesses that support early care and education.71 The tax credit applies to all centers that participate in the state’s QRIS, the Quality Start Child Care Rating System. The tax credit program works toward the dual goals of improving program quality and supporting the workforce in multiple ways. A tax credit can create demand for quality programs by providing higher tax credits to parents who choose higher-quality centers. Ideally, this will also encourage programs to improve and maintain their quality. Programs serving eligible children can receive increasingly higher credits as they move up the quality rating system, which can be invested in staff through increased compensation or support for professional development. Finally, the tax credit aims to reward educators for pursuing higher levels of education and training, which can increase center quality and, in turn, center star ratings. The early care and education system is at a crossroads. The need for working parents to access early care and education is critical and well-documented, as is the need for that care to be of high quality in order to realize long-term positive benefits for children’s learning and development. In order to dramatically improve early childhood program quality, the federal government must support states in building and maintaining a professional early childhood workforce: one with uniform standards for preparation and training; a clearly defined pathway for career advancement; fair compensation and comprehensive benefits; and robust supports for continuing education and training. By adopting these policies as part of systemic reform, conditions will improve not only for the early childhood workforce but also for the millions of children and families who rely on early educators every day. Rebecca Ullrich is a Policy Analyst with the Early Childhood Policy team at the Center for American Progress, where she focuses on the early childhood workforce, young children with disabilities, and early childhood program quality. Previously, Ullrich conducted academic research related to observations of classroom quality and teacher-child interactions as a graduate research assistant at George Mason University. She also provided research assistance on evaluations of federal programs related to higher education; adult basic education; housing; and science, technology, engineering, and math education with Abt Associates in Bethesda, Maryland. Katie Hamm is the Senior Director of Early Childhood Policy at the Center. Prior to joining the Center, Hamm worked as a program examiner at the U.S. Office of Management and Budget on federal child care and early education programs, including the Race to the Top Early Learning Challenge, the Child Care and Development Fund, and the Head Start program. Her work focused on developing budget proposals to strengthen the quality of and access to early childhood programs. She also worked on international issues in early childhood while on detail to the Organisation for Economic Co-operation and Development. Earlier in her career, Hamm worked at the Center for Law and Social Policy and the Institute for Women’s Policy Research on child care and early education issues. Leila Schochet is a Research Associate for the Early Childhood Policy team at the Center. Prior to joining the Center, Schochet conducted senior research around staff retention and wellness in child care centers in Addison County, Vermont. She also interned at the Institute for Educational Leadership, where her work focused on communicating the importance of family and community engagement in education. Schochet is originally from Princeton, New Jersey. She holds a bachelor’s degree in psychology from Middlebury College. The authors thank our colleagues at the Center for American Progress for their review of previous drafts of this report: David A. Bergeron; Ben Miller; Angela Hanks; Karla Walter; Rachel Herzfeldt-Kamprath; Jessica Troe; and Simon Workman. We also extend our appreciation to Meg Benner, Jaya Chatterjee, Netsy Firestein, Lauren Hogan, Kat Kempe, Lea J.E. Austin, and Marcy Whitebook for their helpful insight. Finally, the authors would like to acknowledge Mary Jo Smith and Jenna Conway of the Louisiana Department of Education for their help in verifying information in this report.